Pokhara Sub-metropolitan city is the second largest city in the country and is also the regional Capital of Western Development Region. The city is growing at a staggering rate of 6.952 percent per year compared to a meagre national average of 1.35 percent per year. 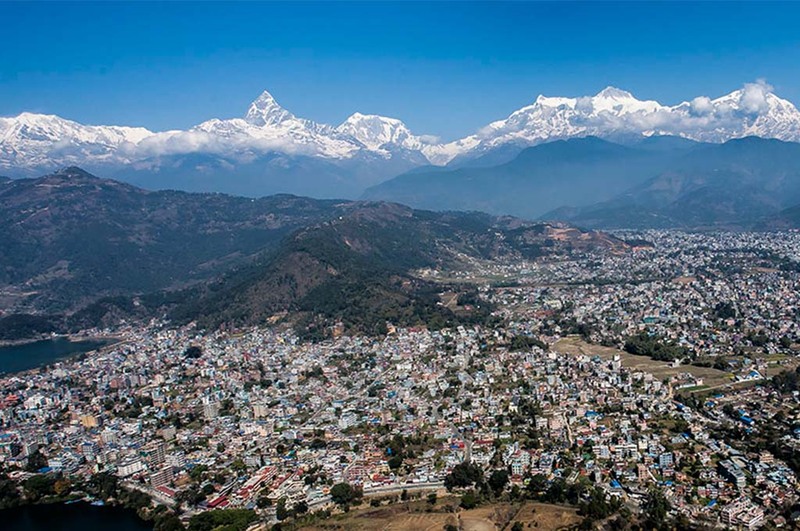 Beyond the rapid urban growth and administrative importance to the region, Pokhara is also the preeminent tourist (both domestic and international) destination of Nepal. Its karst topography and sharp elevation rise have meant that Pokhara is bejeweled with lakes, caves, waterfalls, and gorges. Unfortunately, the western segment of Nepal on which Pokhara is situated also lies on the Main Himalayan Thrust fault that has not ruptured for the past 500 years. This delay in the normal pattern of the rupturing of the fault has only heightened anxiety regarding the eventual threat of a massive earthquake. Beyond the threat of earthquake, this region suffers from landslides, floods and lightning strikes that take the lives of hundreds of people each year. Due to its susceptibility to such natural events and the presence of a highly dense population, Western Nepal is now considered as one of the most natural disaster prone regions in the world. Pokhara’s resiliency and preparedness to deal with a natural disaster is of utmost importance to the region. The need to prepare Pokhara also stems from the chaotic scenes witnessed in Kathmandu right after the 25 April, 2015 earthquake. The earthquake highlighted the importance of a planned city and drilled home the need for creating a centre for effectual response. Kathmandu Living Labs (KLL) is the local implementing partner of the 2C (Secondary Cities) Pokhara project and works in cooperation with the American Association of Geographers and the United States Department of State. The 2C Pokhara project focuses on the development of disaster resilience and emergency management in the city of Pokhara. Kathmandu Living Labs helps local partners and communities within the city of Pokhara to create a robust OpenStreetMap (OSM) data of their city and develop a community which is able to update, maintain and make effective use the collected data. In the long run, the 2C Pokhara project envisions the formation of a geographic information sensitized community that is able to use the collected OSM data to mobilise strategically, create applications and use tools such as Quakemap.org in the advent of a major disaster. Engage local people, community and various government and non-government organizations in mapping activities, helping them understand various mapping tools and disaster management concepts. Forge and strengthen partnerships with local authorities; sensitize them, train them on collection, usage and dissemination of map data. Organize events like Open Data Day in order to celebrate and make people aware about the usefulness of data when they are open. Organize Developer’s Mapping Parties to leverage the power technology in using open data to solve societal problems. To increase disaster resilience and emergency preparedness in the city of Pokhara and in the region. Local people and community - the first responders in case of a major disaster. Local government and non-government authorities. Academia - national and international schools and colleges through Mapping Parties, Developers’ Meet, etc. The 2C Pokhara project is constantly expanding the spatial knowledge of the city and the surrounding areas. At this point the project is at stage where it is trying to seek new partners, publish thematic maps and enhance the attributes of the collected data. In addition to this, a hundred percent of the uploaded OSM data of Pokhara have now been translated into Nepali. 2C Pokhara project has reached a fork in the road which challenges us to direct our efforts on two fronts. With the location of major features such as schools, hospitals, government offices, roads and building footprints mapped we now seek to collect socio-economic attributes of these points. This effort will also challenge us to reach out to schools and communities. In parallel to this we will also continue to expand our network and partnerships with formal organizations like Municipality Government, Nepal Army, Nepal Police, Red Cross, etc. and help develop their capacity. This will be vital as we try to expand the uses of data in disaster preparedness, urban planning, governance services and technology-driven entrepreneurial activities. Spatial analyses on urban growth patterns and navigation uses will be developed. The creation of an open information infrastructure in Pokhara will see the establishment of a model resilient city and the headquarters of relief work of the entire western Nepal. An example of such open information infrastructure is the enriched dataset in OpenStreetMap created as a part of this project (view the pdf version of the maps here). In case of the April 25 earthquake, majority of relief operations were reactionary and ad-hoc. The 2C Pokhara project aims to transform the lessons learnt from that earthquake into actionables and prepare Pokhara before disaster strikes. In doing so, Pokhara - one of the fastest growing cities in Western Nepal will have a fighting chance in case a major disaster strikes.